Enter information about your document shredding needs and we will promptly follow-up. On-site document shredding provides you with a service of Shredding confidential information immediately before it leaves your facility. Our Houston mobile document shredding trucks come to you and cross-cut shred at your location. Our uniformed drivers will remove confidential documents from your facility and transport it to our secure records destruction center. Off-site document shredding is usually preferred by larger volume clients. We will service your document shredding account on a monthly, biweekly, weekly, or daily basis. Each customer’s needs are different and we set the account up according to your needs, not ours. Many clients rely on Vanish Document’s shredding services Houston purge service and use purges for office and storage clean-outs. We can shred any quantity of material which can be handled with on-site or off-site equipment. Our capabilities are 6 tons an hour on-site and 15 tons an hour off-site. With our shredding Houston service, we destroy much more than paper. Some of the types of Documents we destroy include: apparel, film, hard drives, magnetic tapes, floppy disks, credit cards, micro film, x-rays, counterfeit products, product defects, seismic maps, 3290 tapes, and out dated Documents. Approximately 1 billion trees worth of paper are thrown away every year in the U.S. Every ton of paper recovered for recycling is a ton that doesn’t go to the landfill and saves 17 trees. 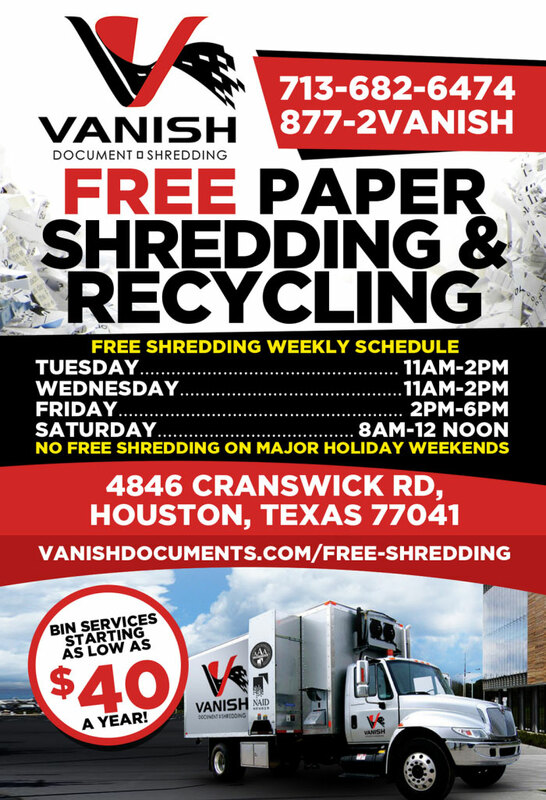 At Vanish Document Shredding Houston we contribute to the conservation of our environment by recycling all Documents when possible. Paper is a valuable resource and something that we can’t afford to waste. Every year Americans use an average of 700 pounds of paper products per person. All client witnesses are welcome both on-site and off-site to view our document destruction services. Each client receives a certificate of destruction upon completion. We provide you with confidential locking containers to secure the sensitive documents inside. These bins are supplied free of charge. When your business requires immediate shredding service, we will dispatch a truck to your location within one hour. When your business requires immediate on site or off site document shredding services, we will dispatch a truck to your location within one hour. Shredding Houston. Vanish Documents is dedicated to the highest level of security standards for document shredding Houston services. Servicing the Greater Houston Area. Site optimized, designed and maintained by Global Graffiti, Inc.